LG G5 Android 7.0 Nougat Official Update is Now Available. This is a good news for all LG G5 Android users, the smartphone which was released this year together with other flagship has been confirmed to get the latest android version. The manufacturer has already announced the start of the upgrade this phone to Android 7.0 Nougat. First of all users will receive the new firmware OTA update from South Korea, and later, the update will be available in North and South America, Asia and other markets. We at LG companies know that our customers need the best, most advanced mobile technology - said Kim Hyun Jung, senior vice president and head of the research division and development LG Mobile company. Providing our software updates to customers demonstrates the company's commitment effective support services and users and provides them with the opportunity to make the most of their devices without extra effort. 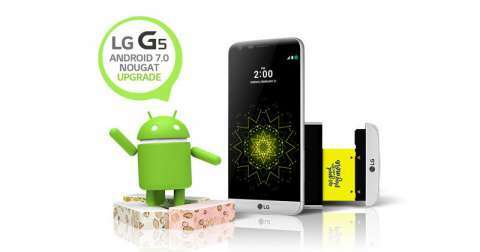 Android 7.0 Nougat contains a number of new features designed to enhance the performance and usability of smartphone users LG G5. For example, the function In Apps searches for installed applications on the device (both standard and downloaded from the store). The new multi-window interface allows you to switch between programs by double-tapping and run two apps on one screen. Advanced settings and personal "smart" notice enhance the use of smart phones, without requiring any effort from the owners. Unfortunately, LG is in no hurry to share plans on updating their other mobile devices to the latest version of Android. Phonetweakers: LG G5 Android 7.0 Nougat Official Update is Now Available.